UPDATE 3/3/15 – Gov. Mead Signed HB 56 Today! 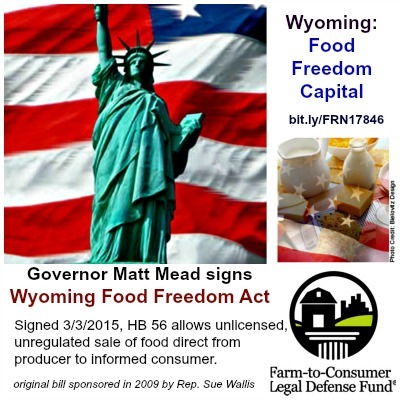 RECLUSE, WY—(February 17, 2015)—The Wyoming Food Freedom Act [HB0056] has passed the Wyoming House of Representatives by a 60–0 vote and has cleared the Senate Agriculture Committee. The bill will now be heard by the full Senate; if passed, the bill will be sent to Governor Mead’s desk for a signature. The bill sponsored by Representative Tyler Lindholm would stop overregulation of locally produced foods typically sold at farmers markets and like venues. As long as there is only a single transaction between the producer and the informed end consumer, there would be no government regulation or inspection. Meats would not be allowed to be sold in this manner, except for chicken. Chicken meat is already allowed under federal regulations. “This law will take local foods off the black market. It will no longer be illegal to buy a lemon meringue pie from your neighbor or a jar of milk from your local farm,” said Representative Lindholm. The Senate committee hearing was packed with consumers, ranchers, farmers and small food producers. They told the senators that the government should not be involved in dictating what kinds of food an individual wants to buy. State health officials and Department of Agriculture representatives attended the hearing and answered questions posed by the senators. They had some concerns about food safety, but did not testify against the bill. The bill passed the committee with Sens. Paul Barnar (R-Evanston), Leland Christensen (R-Alta) and Dan Dockstader (R-Afton) voting for the bill; Sens. Fred Emerich (R-Cheyenne) and Gerald Geis (R-Worland) opposed the bill. Services provided by the Farm-to-Consumer Legal Defense Fund (FTCLDF) go beyond providing legal representation for members in court cases. Educational and Political Action Services also provide an avenue for FTCLDF to build grassroots activism to create the most favorable regulatory climate possible. In addition to advising on bill language, FTCLDF supports favorable legislation via action alerts, social media outreach, and the online petition service. Prefer to make a tax-deductible donation? Contact us by email at [email protected] or call 703-208-FARM (3276). Use the online petition to email all members of the Wyoming Senate then follow up with phone calls to the Senate receptionist at 307-777-7711. Click here for links to Senator lists. Long before the advent of mass production, multi-national corporations, protectionist unions, and overzealous bureaucrats, the Good Lord and Mother Nature created human beings dependent on food harvested from living plants and living animals. This is one of the most intrinsic facts of life without which we cannot survive. As living plant and animal tissue, everything we consume to sustain life, also carries with it the possibility of disease and decay. If our prehistoric ancestors had not figured out how to handle, prepare and store these foods safely, none of us would be alive today. The United States has allegedly the safest food system in the world, and yet every day we hear about another horrific outbreak of foodborne disease…almost always traced to some huge food processing plant. We hear about underpaid, overworked assembly line, factory production, food industry workers neglecting to do essential steps, or making mistakes that cost lives. Many people have decided to take back control of what they put in their mouths and feed their families. They have decided that it is far safer, and indeed far more satisfying and healthy, to buy food that they know exactly where it came from, how it was raised and by whom-exactly what the animals were fed, and how they were treated-exactly how the soil was prepared, and what if any unnatural substances were applied on or around the plants-how it was harvested and prepared. They abide by the ancient adage that it is best to shake the hand that feeds you. Many are truly enthusiastic about participating in and enhancing a thriving local agriculture economy.